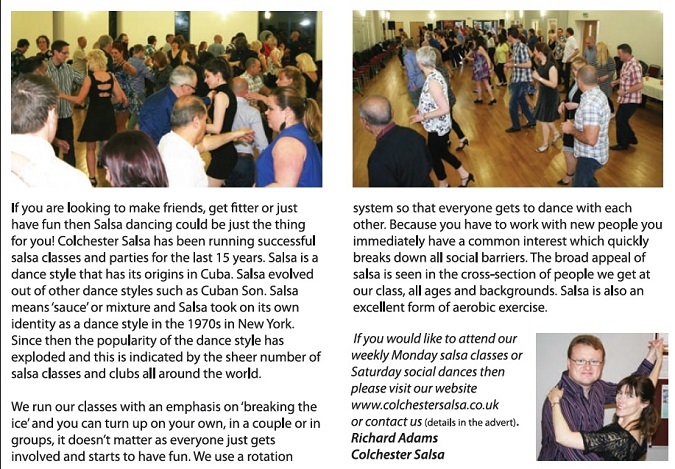 Colchester Salsa is a owned and run by Richard Adams. He has 16 years experience in teaching salsa. "My priority is to teach you salsa in a fun, relaxed and safe environment. I also invite several guest teachers to help at my classes and events, recently including Strictly Stars Ian Waite and Kristina Rihanoff. Each bringing their own unique style, talent and sense of fun to the lessons. Many of my students have been with me for a number of years and have become good friends. Salsa is a very social experience and those attending often attend local salsa events in Ipswich, Chelmsford, Lowestoft & London". Richard Adams has been salsa dancing for 20 years and teaching for 16 years. He is also helped by instructor Laura (On his right in the top left photo), who also has 16 years teaching experience.